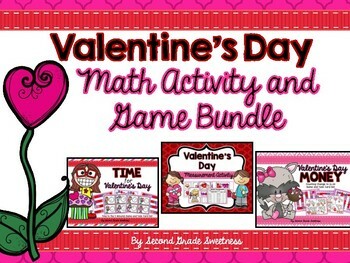 Are you looking for Valentine's Day math games or activities? This common core aligned set of math games includes time, money, and measurement skills! They would be great in Valentine's Day math centers or used in large or small group! This game set comes with 36 time cards, a spinner, 5 game boards, and a task card recording page. This set comes in color and in ink-saving black and white. 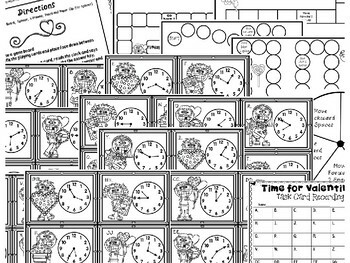 Students will practice telling time to 5 minute-increments and playing a fun game at the same time. This game set comes with 40 money cards, a spinner, 5 game boards, and a task card recording page. This set also comes in both color and ink-saving black and white. Students will practice counting change up to $1.00 and playing a fun game at the same time. This activity set comes with 14 adorable Valentine’s Day themed objects and 3 different recording sheets. Students will measure the objects in inches, centimeters, or both and record their answers on the recording sheet.